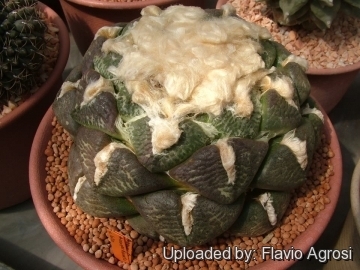 Description: Ariocarpus fissuratus var. lloydii is traditionally distinguished from var. fissuratus by its higher, somewhat rounded and more convex stem. The cv. Latus (whatever that means) is the lovely large tubercle type of the species. In this cultivar the tubercles are fewer but very fat and broad (at least two times wide) and rounded at the apex. Stem: Somewhat rounded and sometime even columnar shaped in cultivation in adult specimens ranges from 15-25 cm in diameter. Tubercles: Ovate, broad at base and rounded at the apex, about 3 to 5 (or more) cm wide. They lack edges and lateral longitudinal furrow and are only finely rugose with quite coarse and irregularly warty. Propagation: By seeds, remembering that seedlings dislike strong light and dry conditions, and need to be repotted frequently. Eventually, as they become mature, they reach a maximum size of 25 to 27 cm. However, old plants become senile and have a tendency to succumb to disease and a weak root system. At this stage, as is well known, they die suddenly. 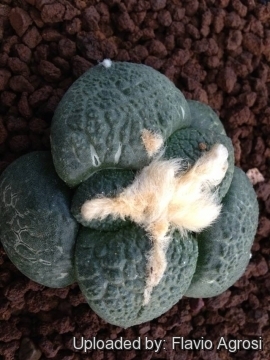 So, after they reach 20 cm in diameter grow them slowly, and adopt a new repotting period, using intervals of every 2 - 3 years. Additionally grow them under drier conditions or with stronger sunlight. Plants are often grafted to accelerate growth, as they would generally take at least a decade to reach maturity on their own. But the grafted plants are typically rather tall- growing, compared with plants on their own roots, that are usually flatter to the ground. 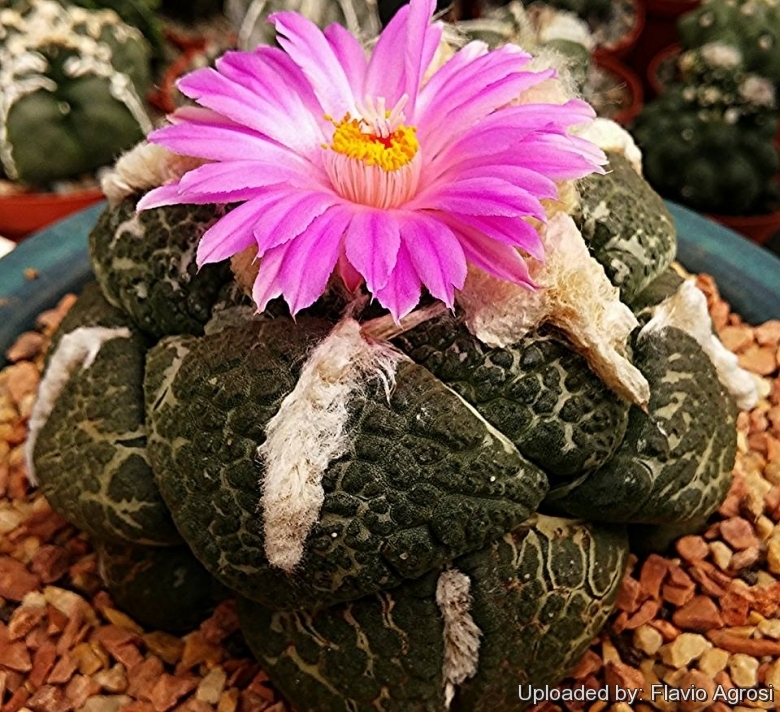 Ariocarpus fissuratus var. lloydii starts blooming at the age of 6-12 years.